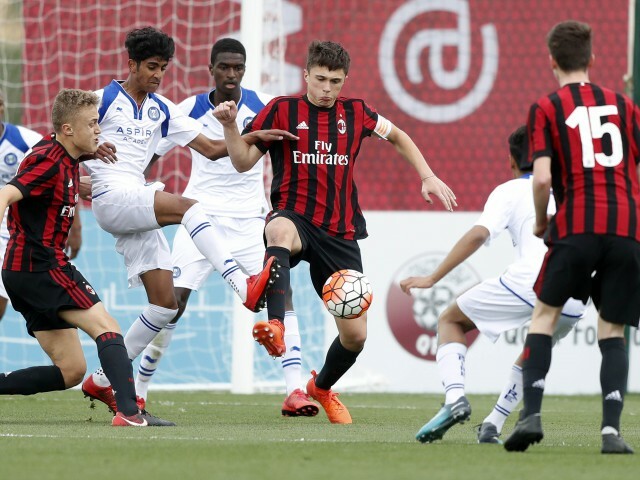 AC Milan defeated Aspire Academy on penalties to take in a low-key encounter that finished 1-1 in normal time, giving the Italian side seventh place in the Al Kass International Cup. In their previous three matches, despite showing plenty of attacking intent, the Rossoneri had managed to score only one goal, in their opener against Wydad – a match they should have won far more convincingly. At the other end, Milan had leaked eight goals, so Aspire had every reason to feel confident, having acquitted themselves well throughout the tournament, and only narrowly failing to reach the semis due to a 1-0 defeat at the hands of Espérance de Tunis. Milan were almost ahead on seven minutes when Daniel Maldini found space inside the area to the left of goal, but his powerful rising shot was beaten away by Mahmoud Abunada. The young keeper, who has been in fine form throughout Al Kass 2018, then showed great awareness to deny Riccardo Tonin from close range. As the game reached the midway point of the first half, Milan were playing the more composed football, stringing a series of intelligent moves together but still lacking a cutting edge up front. However, on 27 minutes, they were awarded a penalty when Aspire midfielder Naif Alhadhrami was adjudged to have shoved Riccardo Martimbianco as they tussled for possession in the area. Tonin’s hard and low spot kick went straight down the middle, and Milan were in front. The Italians were good value for their lead at this stage, having dominated possession and kept Aspire largely confined to their own half. On the stroke of the interval, they almost doubled their lead when Tonin advanced into the area and cut inside, before firing in a low shot that Abunada was again equal to. As the second half commenced, Aspire upped their game as they sought a route back into the match, and a chance arrived on the hour, when Ahmed Alganehi was upended 25 yards from goal in a central position. The classy forward picked himself up and took the resultant free kick, producing a magnificent effort that curled into the left corner, leaving keeper Niccolo’ Zanellato with no chance. With the very next attack, Alganehi had a great chance to give his side the lead, having been played in from the left by Mekki Tombari, but he got under his shot from the edge of the area and it sailed over the bar. Aspire were enjoying their best spell of the game, with the industrious Faisal Azadi dictating proceedings from a deep-lying position in central midfield. However, with 15 minutes remaining Milan broke clear and had a golden chance to go ahead when Tonin rounded Abunada, but he was somehow unable to apply the finishing touch with the goal at his mercy. The action swung to the other end, with Fahad Al-Abdulla meeting a corner with a firm header that Zanellato only just managed to keep out. Aspire sensed opportunity and, with five minutes remaining, Tombari sprinted clear down the right and fashioned a glorious chance, but his weak shot allowed the Milan keeper to save easily. There was nothing to separate the sides at full time, and a penalty shootout ensued. The first five kicks were all converted, and then Zanellato saved well from Aspire’s Mohammed Al-Naimi. It meant that Tonin, with Milan’s fifth, was required to repeat his feat from earlier in the game to secure victory, which he did with a minimum of fuss.